Chess is a strategic board game that requires you to plan moves in advance. Capture your opponents king to win this game! Below you will find the video tutorial and explanation. Setup: The board is positioned with the light colored square in the bottom right corner. Your second row is filled with pawns. 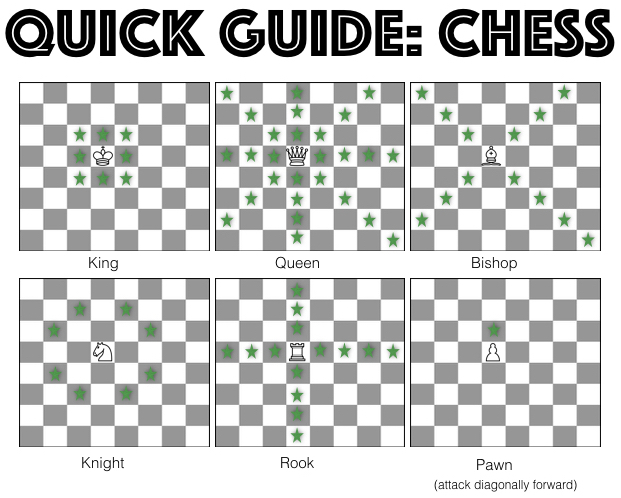 Starting from the left corner, your first row is setup as rook, knight, bishop, queen, king, bishop, knight, rook. The black pieces should mirror the white pieces so that each player’s queen and king are across from each other. Objective: The object of the game is to capture your opponent's king. This is done through the movement of your pieces. Piece Movements: The king can move one square in any direction. The queen can move in any direction and any number of squares. The bishops can move diagonally any number of squares. The knights move in an L shape, 2 squares up, back, or side to side than, 1 square perpendicular to the first move, or vise versa moving 1 square than 2 squares. The knight is the only piece that can move over other pieces. The rooks can move forward, backwards, and side to side any number of squares. The pawns can move 1 square forward, with the exception of a pawns first move, which can be moved 1 or 2 squares forward. Attacks: When a piece makes a move that ends on the opponents piece, that piece is captured and removed from the board. The pawns cannot capture a piece that is right in front of it. The pawns can capture a piece that is diagonally in front of them. This diagonal move by a pawn can only be made when capturing a piece. Game Play: The game begins with the white pieces going first. Each player can make one move per turn. Players take turns making moves with the goal of capturing the opposing king in mind. When a piece is captured, it is removed from the board. When a move is made that results in the opposing king being able to be captured on the next move, "check" is announced. When "check" is announced the opposing player must take the king out of danger by either moving the king, moving another piece to block it, or capture the piece that is threatening the king. When a move is made that the king cannot escape, "checkmate" is announced. The player announcing checkmate wins the game. A king cannot make a move that would put itself into check. If no moves can be made without putting the king in check, the game is a draw. If a pawn makes it all the way across the board, it can be promoted to any piece. The promotion is made by removing the pawn and replacing it with another piece. If promoting to a piece that is still on the board, create a piece. For example, you can promote a pawn to a queen, even when your queen is still on the board, by stacking a pawn on top of a rook. Announce the created piece is a queen. When there are no other pieces between the king and a rook, the king can move 2 squares toward the rook and the rook is moved to the other side of the king. This is known as castling. The castling move can only be made if it is the kings first move and the involved rook’s first move. Also, the king cannot be in check or move through check to make this move. When a pawn moves 2 squares on its first move, an opposing pawn can capture it if it would have been able to capture the pawn had it only moved 1 square. This is known as en passant. The opposing piece would move as a normal attack and remove the pawn. The en passant attack has to be executed immediately after a pawn’s double jump move.